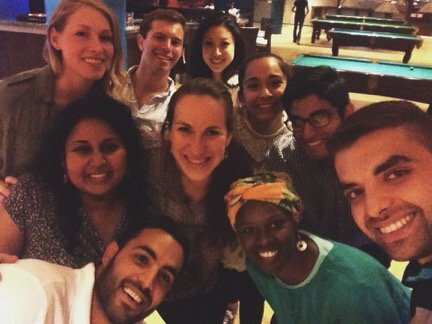 Penn International Impact Consultants: GFP’s Summer Volunteers! 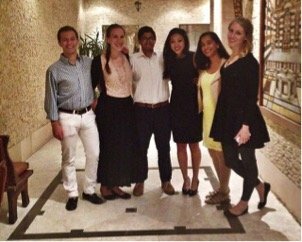 For three weeks this summer, we had six fantastic volunteers from the University of Pennsylvania working with GFP in their role as Penn International Impact Consultants (PIIC). They helped us write country strategies, develop a business plan to increase profit from renting our headquarters event facilities, conduct donor and media research, and spread the word about our first crowdfunding campaign. 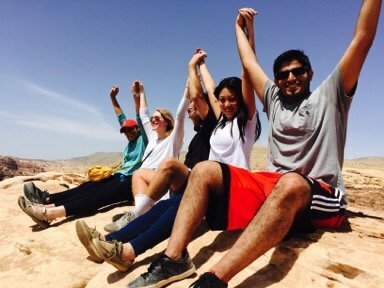 Read on to meet Aimee Knaus, Ali Pardesi, Annamarie Marquet, Bettina Lu, Logan Gardener, Rahima Jamal, and hear more about their time with GFP in Jordan! Hello, I am Aimee Knaus. I am almost halfway done with my dual degrees in International Studies and Business. I have had the privilege of living in some exciting places including Togo and Amman – where my family has been living since 2004. My name is Ali, and I’m a freshman at UPenn. I consider myself to be from Chicago, but home has always been an elusive concept for me. I was born in Singapore and lived in India, Indonesia, and Dubai before coming to Philly for college. Hi my name is Anna. Born in New Jersey and living in Philadelphia, I have just graduated with a degree in Middle Eastern Studies. My name is Bettina Lu. I’ll be a sophomore next year at the Wharton School of Business in the University of Pennsylvania, concentrating in Finance. Hi, my name is Logan Gardner and I am a Wharton sophomore from the heart of Kentucky horse country. Hi! My name is Rahima Jamal and I’m a freshman in the College of Arts and Sciences. I’m originally of Pakistani descent and have been interested in foreign policy as a means to alleviate the turbulence in the Middle East and South Asia. 1. How or why did you decide to come to Jordan with GFP? Ali: PIIC works with a number of different NGOs, but GFP is the only one that does peace-building. Bettina: I was also very interested in learning more about consulting and having the opportunity be in the Middle East, an area of the world I’ve never been, made it even better. Rahima: Even though I have known for quite some time that I’m interested in law, I haven’t been able to explore other industries that I may consider in the future. 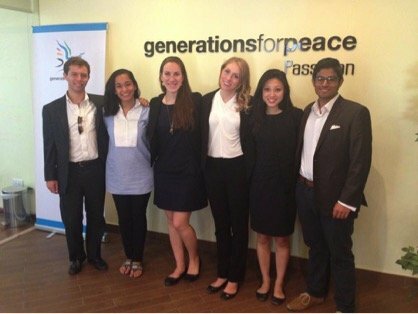 The combination of consulting and non-profit work that GFP was offering through PIIC was unlike any other, and I also haven’t spent an extended amount of time in the Middle East. 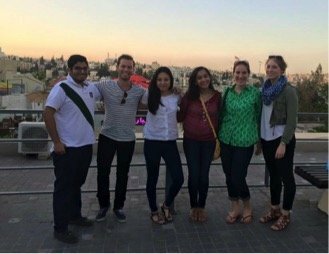 Aimee: This summer, I was looking for an opportunity that would allow me to have an international impact while working in Amman. 2. What was your first impression of GFP? Ali: One of the first things I noticed about GFP was the collaborative and transparent working environment. This became apparent to me during the morning circle on our first day. I loved that every member of the team was so aware of all the different assignments that were going on instead of being completely wrapped up in their own work. Aimee: I really love the dynamic in the GFP workplace. It is so cool to see people literally from around the work so passionate about peace building and bonding together to work towards common goals. 3. What has surprised you most about working with GFP? Annamarie: I think going into my time with GFP, as part of a three week program, I had initially expected them to put us on very basic work, doing things that might not have much of an impact. Even after hearing about the projects we would be working on ahead of time I had not idea that they would be as practical as they were. The team was assigned to projects that were very exciting and meaningful and as a result, I left GFP feeling like I had just made a positive impact. Logan: I was pleasantly surprised by how open everybody was. The entire staff just wanted to get to know us while demonstrating a wonderful open-mindedness regarding any recommendations we had. Rahima: I was very pleasantly surprised at how everyone in the organization, regardless of their position, was so close to one another. Aimee: The amount of work that everyone does! I had no idea how much work went on behind the scenes of GFP. It is always crazy to hear how much everyone has to do every day, with so many meetings and tasks. 4. What do you wish other people knew about GFP or Jordan? Annamarie: That Amman is a dynamic city where people of all different walks of life can enjoy incredible food and friendly people. Ali: Given all the conflict in the Middle-East, I think Jordan is assumed to be unsafe by people who have never been there. I truly wish that people knew how safe of a country it is and what a wonderful place it is to explore. Logan: I wish other people could understand how safe I felt in Jordan and that the Middle-East isn’t something to be afraid of – there is such beautiful culture there that you truly cannot experience anywhere else. Aimee: I wish people understood more of how well thought out GFP programs are. These programs are not just randomly planned out but are very well planned and so much research goes in to decide what program to start, which conflicts to address and where. This is what makes them so sustainable and worthwhile. 5. What might someone be surprised to know about you? Bettina: I really like extreme sports. Annamarie: I initially began my undergraduate career in art school. While I decided against pursuing art as a career, it is still something I hold close to my heart. Logan: I cooked chicken for the first time while in Jordan and instead of using spices I accidentally breaded it with Crystal Light pink lemonade mix. It was as delicious as it sounds. Rahima: Every person in my family is pursuing medicine except for me. Aimee: I love cheesecake, ice-cream or anything with chocolate in it. I have been singing in a choir since I was in fourth grade. 6. What would you tell someone who is thinking about donating to or volunteering with GFP? Annamarie: That this organization is on the forefront of peace-making. With a greater focus on addressing challenges of all types, they work to prevent future conflicts, giving peace a better chance in the future. Logan: DO IT! The people who work there are some of the coolest people I’ve ever met and it was a life-changing experience that taught me much about myself while giving me new perspectives to approach life. Ali: Do it- the cause you are supporting and the people you meet through GFP will definitely make it worth your while. Rahima: The difference between donating to GFP and donating to other relief or developmental organizations is the cascading model GFP offers, which makes its work sustainable. Aimee: I have never met so many positive, inspiring, and motivated people especially all under one roof! 7. What do you think will change about GFP over the next five years? Bettina: I think they’ll become even more effective and continue to build their impact, innovation and sustainability. Annamarie: I think GFP’s practices will change as the world changes around them. They might find their presence in different countries to be less involved in state-on-state conflict and more concerned with intra-state, socially focused, conflict. Logan: I think that GFP is only going to grow larger and that they will begin operating in the western hemisphere with potentially establishing a field office in the States. Wouldn’t be shocked to see them become one of the largest peace-building players in the game! 8. 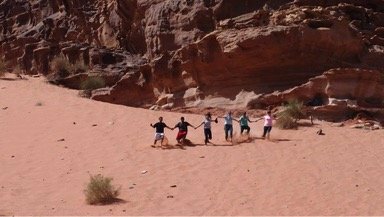 If you weren’t volunteering with GFP in Jordan this summer, what would you be doing instead? Annamarie: I would have been in Philadelphia for several weeks before coming over to Istanbul for another internship. However in this instance, I wouldn’t have gained the experience that I did and as a result I would go into future projects shorthanded. Logan: In all honesty I would probably be playing with my dog and watching Netflix full-time while working in a restaurant or something part-time until I leave to study abroad in Sydney this July (one month!). Ali: Any combination of sleeping, eating, and watching TV; I’m very glad I found a more productive use of my time. Rahima: I most likely would be working in DC – I am interested in working at a think tank, in public policy, in an executive agency, or in a Congressional office. Aimee: I would probably being traveling somewhere else either volunteering with refugees or researching about the culture in the Middle East/North Africa region. 9. What are your plans for the next year or after you graduate? Bettina: After I graduate, I’m looking to go into private equity, although I really do love social impact, so I will be definitely exploring it more in the future. Annamarie: I have just recently graduated and so my plans for the near future will be to work in Istanbul in the U.S consulate until around September and then pursue work in the field of refugee resettlement briefly before going back to school for my master’s degree. Logan: Between studying abroad in Sydney, Australia at UNSW next semester, planning to live in a Buddhist monastery for a month after, and continuing my studies at Penn I’m going to be pretty busy for the next two years. Ali: Next year will be my sophomore year at Penn. I plan on studying Economics and hopefully staying involved with PIIC in whatever way I can. Rahima: I am pursuing a degree in “Philosophy, Politics, and Economics”, an interdisciplinary major that Penn offers that combines three different departments. I’m also on the pre-law track, but I am definitely now considering consulting and non-profit work as well. Aimee: This fall I am doing an exchange program so I will be studying at Al Akhawayn University in Morocco. In two years, when I graduate I hope to get an entry level position at an international NGO.